All exhibition opportunities are now taken. The information below is for reference only. Join over 20 exhibitors, who will be engaging with participants over this three day event. Find out why to get involved . Exhibition package £2,500 Members, £3,000 Non-Members. Complete the exhibition form to secure your place. The exhibition area at University Place in Manchester. If you would like to contribute to the wider conference programme, please make a submission to the Call for Proposals or consider one of the sponsorship opportunities to secure a pitch in a plenary session. We recommend that you complete the exhibition form and choose your preferred stand as soon as possible. 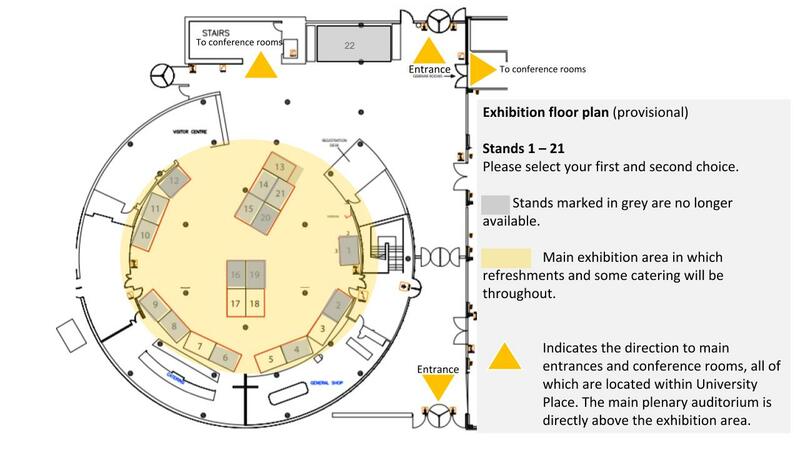 Once we have received your completed form, you will be allocated your stand, receive further information about how to order additional services or equipment for your stand and your details will be added to the conference website.